This is the sight I woke up to yesterday. I thought I was back in Idaho or Utah or Illinois. But no, this really is Virginia. You can kind of almost see my car parked across the street. I didn't get home until late last night after the snow had already set in, and because I live on a hill, I knew there was no way I would be able to park in my usual space in front of the house. But don't you worry--it proceeded to snow for 14 more hours after this picture was taken. 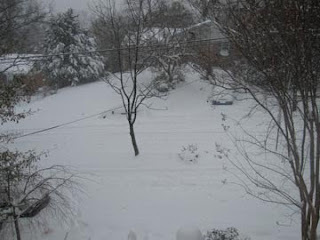 I had gone out around 1 p.m. to dig my car out as I was supposed to go to a friend's house last night. I had to force the front door open and then stepped into a pile of snow that came up to my knee. It took me about five minutes just to get across the street to my car, and after two hours or scrapping and shoveling, my car was even more stuck than when I first started. I ditched the car and decided to shovel the walk. They were all sold out of shovels, so my kind neighbors let me barrow theirs. I had to shovel my way from their front porch to mine, not an easy task in 20 inches of snow. But along the way I talked to sledders and skiers and snowboarders and even one mom on foot whose 9 month-old baby was so snug in her blanketed carrier she was sound asleep. One of the craziest things about all this snow is that it's not really that cold out. Even being outside for two hours, I wasn't cold, just very, very wet. And though my car is once against buried from sight in all the snow that fell in the evening, everything is already melting. I can hear the icicles on my roof drip, drip dripping, and underneath all that powdery white is a good inch of nothing but slush. I feel like I'm in the middle of a Christmas song. Pick one about snow, and there you have my front yard. Can I please be dreaming of a green Christmas?